Healthy version of the delicious classic. Serve two tortillas per person. 1. Mix and combine ground turkey, cilantro, Vegeta, pepper, cumin and onion. Leave to stand for 15 minutes. 2. Shape approximately 2 tablespoons of the mixture into meatballs. You may get 18 -28 meatballs, depending on their size. 3. In hot oil fry the meatballs until golden brown. Place the meatballs on a paper towel to remove excess fat. 4. Sauté the onion rings and tomatoes in the same oil until the onion turns golden brown. Also place on a paper towel to remove excess fat. 5. Lightly warm the tortillas, on each side, in a pan without fat. 6. 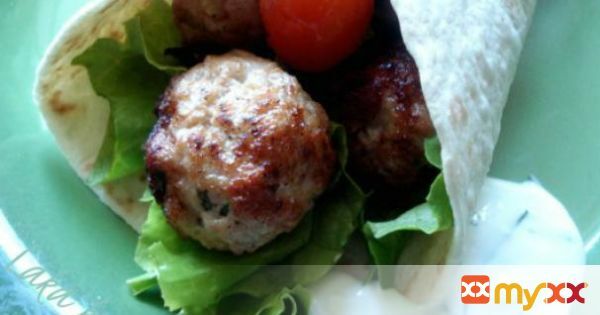 Place on each tortilla some salad, fried onion rings, tomato and 3 turkey meatballs. Roll it up into a cone shape, secure with a toothpick. 7. For the sauce mix and combine yogurt, mayonnaise and chives, and pour over the tortilla filling.